The inflammation of the meninges is known as meningitis. It can be due to a bacteria or a virus. It affects the brain, the spinal cord and membranes. If it occurs due to bacteria, then it is called as bacterial meningitis. But if it is due to virus, then it is called as viral meningitis. Bacterial meningitis should be treated immediately as it is very dangerous and can even lead to death. Viral meningitis resembles flu. Flu is also known as influenza and of two types, the influenza A and influenza B. Flu is caused by a virus called influenza and hence the name. The bacteria and virus enters through some cut or abraded surfaces into the blood and from there, they enter the meninges of the brain causing inflammation of the meninges. It can also occur due to infections of the ear and nose. Any injury of the head can also cause meningitis. The severe form of the above mentioned infections leads to meningitis. The causes for flu include infection droplets which can be spread from one person to another, as well as coughing or sneezing, self contact with the eyes, nose mouth and touching objects with virus on them. 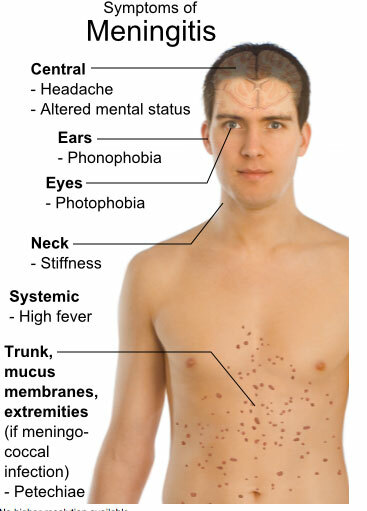 Meningitis is a neurological disease whereas flu is a respiratory disease. The common symptoms of flu include chills, body aches, fever, nausea, vomiting, tiredness, headache and dizziness. After regression of these symptoms, respiratory symptoms preclude over. It includes cough (dry cough), sneezing, runny nose and sore throat. Rarely, symptoms like loss of appetite, sweating, blocked nose and muscle aches may occur. The symptoms of meningitis include stiffness of the neck, headache and fever. It mostly affects children of about 2 to 3 years. The other symptoms include runny nose, lethargy, skin rashes, irritability, Epilepsy, eye becomes sensitive to sunlight, vomiting and diarrhea. The symptoms are mostly similar with the most important differentiating symptom being stiffness of the neck. The symptoms of meningitis vary according to the age of the patient. The complications of flu include sinus infections and ear infections causing otitis media, and pneumonia (rarely occurs). Pneumonia can sometimes be life-threatening. The complications of meningitis include impairment of vision (blindness), inability to hear (deafness), difficulty in learning and epilepsy. The other organs of the body like the kidney, adrenal glands and heart is also affected. Sometimes patient suffer for a long time due to persistent neurological problem. 1.Meningitis can be caused by bacteria or virus whereas flu is caused by virus. 2.Meningitis commonly occurs in young children whereas flu can occur at any age. 3.Meningitis is a neurological disorder whereas flu is a respiratory disorder. 4.The symptoms of meningitis and flu are almost the same except stiffness of the neck seen in meningitis. 5.The complications of flu include sinus and ear infections whereas for meningitis blindness, deafness and some organs are also affected. Luzy R. "Difference Between Flu and Meningitis." DifferenceBetween.net. September 20, 2018 < http://www.differencebetween.net/science/health/difference-between-flu-and-meningitis/ >. I am the mother of an only child, Ryan, who died from of meningococcal meningitis and the founder and executive director of a national organization, Meningitis Angels. The early signs of meningitis and blood poisoning which could improve detection of the disease and save lives are unrelenting fever, leg pain, cold hands and feet and abnormal skin color can develop within (12 hours) after infection and long before the more classic signs of the illness such as a rash, headache, stiff neck, sensitivity to light and impaired consciousness, debilitation or death. According to ACIP/CDC children ages (11) years through college freshmen should be vaccinated against meningococcal meningitis. Hi! I would like to say I am a survivor of flu meningitis. I am a 42 year female and 3 beautiful girls ages 10,8.and 4. I just want to say there is a healer and his name is Jesus Christ. I have no problems of any kind. So you can come through it. There is a healer and like I said it’s Jesus Christ. Jesus is as much a healer as the tooth fairy. Silly myths and superstitions have no place in the modern world. Julia you are an idi. Jesus Christ exist and is our saviour. He will do this by working through doctors to save a person from any disease. Jesus saved my wife’s life while hospitals did a little. Interesting Jesus anecdotes. I am glad you survived. What evidence do you have that you were healed by Jesus? How come he does not heal amputees? Very curious. Hi Frankie, I am terribly sorry to hear such a horrible thing has happened to you and your family. Even after three years have passed, it must be very hard to overcome the pain. My thoughts are with you. Some people believe in Jesus Christ, others in some other form of a God. I will not place an individual person, place or thing for you to believe in, but I will say, whomever you may or may not believe in isn’t the answer, it is all the valuable work you are doing to keep your child’s memory alive. You are serving your child very well and that is a wonderful treasure and gift. May you be blessed in whatever way you are and remember there are many people who have been in your shoes and many who have not. Awareness is key and you are the key to saving lives. I do not, thank goodness, have this sort of situation to relate to, but I just had to write something. Being an adoptee, and a counselor helping those who too have been adopted, I share in loss. Loss is quite widespread and no matter how big or small, or of what nature it exists, it is still loss and still hurts, and sometimes for a lifetime. I do appreciate your love to many and may peace find you!! Thanks so much for your work. I had friends at school who caught meningitis their parents thought they had the flu two of them ended up intensive care with meningcocil sepstercemia or meningitits c as they call it. It came on very frightening fast with in an hour in one case. My sister best friend almost died from meningitis b she was very very ill for some time. Please look out for the symptoms sepsis is deadly so is meningitis it can strike with little or no warning.